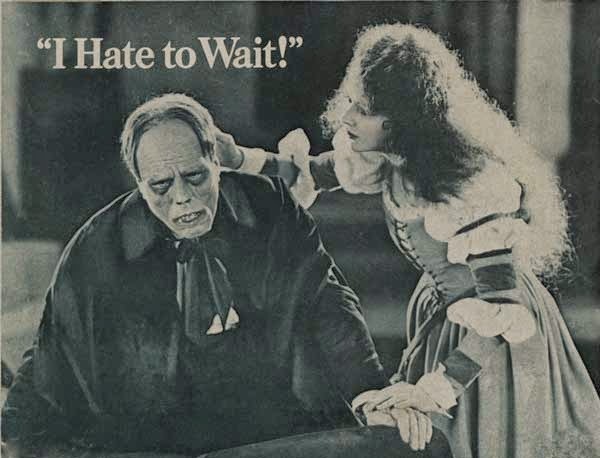 Photo from an ad that used a scene from the original Phantom of the Opera. I cut out the photo and hung it in my office for many years and cannot now remember or find its source. What I’m getting to is that I’ve gotten better at waiting. Why I’m getting to that is because a study published last December mapped individual differences in the experience of a waiting period. They found waiting is easier for some people. I’m sorry; I shouldn’t have waited so long to review the study. Researchers from the University of California-Riverside tracked 50 law school graduates via survey questionnaires, while the graduates awaited results of the bar exam they took to practice law. The graduates were surveyed shortly before and after the exam, twice during the four-month waiting period, and immediately before and after learning if they passed. The questionnaires focused on personality traits that reflect people’s comfort with uncertainty, their orientation toward future outcomes--general optimism and pessimism, and their self-esteem. Following an uncertainty navigation model developed by the lead investigator in earlier work, they examined individual differences in the waiting experience; relationships among anxiety, rumination and use of uncertainty navigation strategies; typical timelines of anxiety, rumination and use of coping strategies; and departures from those trajectories. Among key findings for the graduates overall were (1) time seemed to pass more quickly as the waiting period progressed and (2) anxiety was highest and they ruminated the most at the beginning and end of the waiting period. Waiting was easier for some graduates than for others. Those optimistic about the future and comfortable with uncertainty did much better than those who felt good about themselves. So, if you’re seeking coping strategies to handle waiting, all you have to do is become more optimistic and get used to uncertainty. Of course, it might be easier to just wait until you retire. Thank you for waiting for this review and, as always, thanks for stopping by.